Written In Stone – Conservez vos moments mémorables et ces paroles paroles qui n’ont pas de prix pour toujours. Have your memorable moments and priceless words last forever. "Now you can have your memorable moments and priceless words last forever. 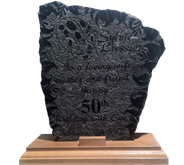 Written In Stone is proud to bring to you these timeless pieces of beautiful granite which allows them to be cherished eternally." Now you can have your memorable moments and priceless words last forever. Written In Stone is proud to bring to you these timeless pieces of beautiful granite which allows them to be cherished eternally. Every piece is precisely handmade using the highest quality granite and natural hard woods. 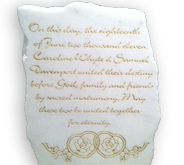 Fully customizable, all stones are cut, polished, and engraved upon request, thus making every stone 100% unique. These precious stones are available for every special moment. Perfect for weddings, birthstones, birthdays/anniversaries, corporative, achievements, or any other occasion meant to be everlasting. You can now have those exceptionally precious words last forever. Have your vows Written In Stone. Give a whole new meaning to “Birthstone” by commemorating the birth of your loved one with a one-of-a-kind gift. Give an elegant touch for a once in a lifetime moment with our beautiful Birthday and Anniversary stones. Enhance your professional image, give a rock solid and refined look with these 100% customizable stones. 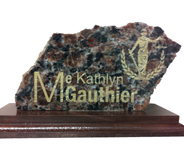 These elegant and precisely handmade Achievement stones are available in all sizes and 100% customizable. 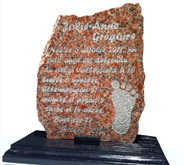 Beside our personalized stones we also offer stone engraving for a wide variety of applications: walkways, gardens, address/location, pillars, door frames, counter tops, fireplace mantles, artistic, poetry paths, etc. 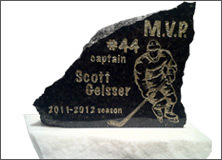 We also offer engraving on glass, dishes, wood, metals, etc. Your imagination is our limit. Contact us for pricing. Ready to make your memories last forever? Contact us today for a free estimate on your personalized order.